The second bar I grabbed during a quick shopping trip. I am not a coffee drinker, I rarely ever drink the stuff…but I do enjoy espresso from time to time. I grabbed this bar more-so for my coffee-addicted boyfriend than myself. I wanted to give it a try to see if he’d like it… and I think he will. The packaging is the same as the Marzipan bar (here), and I do really like how these packages open. The bar seems to be milk chocolate with a very thick espresso flavored filling. It smells like freshly brewed coffee with a little bit of sweetness. 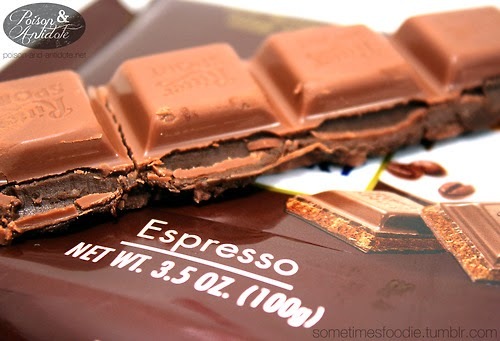 Now, this bar tastes like espresso. It has a strong -real- flavor. It is almost like I am eating chocolate covered espresso beans, but there is no horrible coffee grit in my teeth! I think it is really refreshing, strong and authentic. This is an amazing chocolate bar for the adult palette. I am buying another one of these because I am SURE my boyfriend will enjoy this even more than I will. This is a great, maturely flavored, chocolate bar.